Description: Android Fastboot FRP Reset tool is a very useful small tool for computer & laptop windows operating systems it helps you to Remove various FRP lock and moreover it enables to check connected Android device, remove the pattern lock, remove Xiaomi account, enter into EDL mode. Using this great application you can remove Android FRP without any crack or premium box. This FRP tool has to work on many Android devices to remove FRP but some of the models will not show. Remember that: before reset, remove pattern or flash, etc of any mobile you take backup of important data like, contacts, messages, contents, photos, videos, and recordings, etc, otherwise after resetting or Flashing you will lose all data which had in your mobile. so must take backup and then Reset easily. Android Fastboot FRP Reset Tool is also QC Tool FRP Reset Password - Qualcomm FRP Tool - BST Dongle Tool v3.32.00 and Chimera Tool Version etc. you can free download any kind of Tool from this website. moreover, it has many latest features we have listed here some of the best features for your information just look before downloading and using! our site is one of the best platform of sharing mobile and PC Games, Apps, Drivers, Flashing Files, Tools, PC Suites and much more for our users for free. 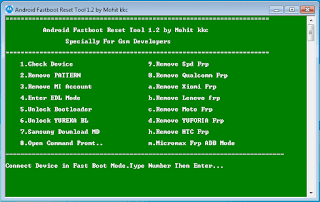 now if you are going to download Android Fastboot Reset Tool then you are on a right way from here you can simply download the Fastboot FRP Reset Tool. Thanks for choosing our website for downloading Android Fastboot Reset Tool. now just click on the below-given download links then automatically begin downloading in few seconds properly. Remember that: the download links are tasted and checked now it works properly 100%.